Pterobranchs are colonial hemichordates living in secreded tubular coenecia. They reproduce by short-lived planulashaped larvae or asexual budding. 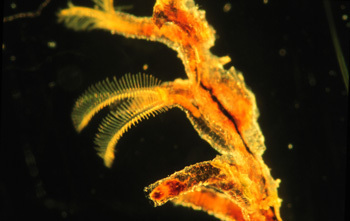 Pterobranchs were originally classified similarly to bryozoans and phoronids based on lophophore feeding structures. Morphological analysis of the feeding structures along with molecular data suggest that the similarities are due to convergence. Study of 18S rDNA sequences indicate that pterobranchs are monophyletic within the clade. This would indicate that pterobranchs evolved from a enteropneust-like ancestor.